I was looking for a new nozzle for my hose as I was in dire need of one since I have a garden that needs to be watered. 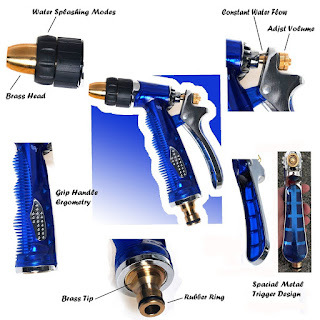 This is heavy duty and has a blue spray nozzle made from 100% metal body and trigger covered with an ergonomic soft pvc for comport grip that is high quality to prevent rust, corrosion, wear. A shock resistant protects the sprayer from accidental drops; Adjustable settings provide a variety of high water pressures for every watering you need the water hose nozzle comes with free 2 quick female connectors and a ¾ thread pipes and rubber set along with extra rubber washers. You can irrigate with a wide range of patterns for every watering needs and only with a slight rotation of the head of the gun. You can get a full range of pressure, from weak fine spray up to flow strong water 100 psi as it is designed for cleaning hard surfaces, washing cars, houses, gardening, pets and plants. olors. I found that with my hose connection that it is not complete fit and leaks a little so I would need to invest in a new hose to correct this. Disclaimer: I received one or more of the products from Tomoson mentioned above for free or at a reduced price in the hope that I would mention it on my blog. Regardless, I only recommend products or services I use personally and believe will be good for my readers. I am disclosing this in accordance with the Federal Trade Commission's 16 CFR, Part 255: "Guides Concerning the Use of Endorsements and Testimonials in Advertising.